Have You Seen Hotboys on the Williamsburg Area Transit Authority Buses? 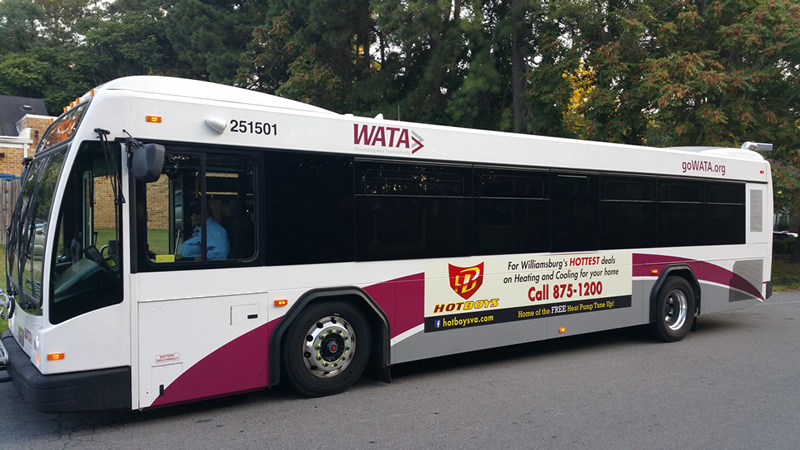 The Williamsburg Area Transport Authority (WATA) has recently increased the size of their fleet with addition of 5 new 35-foot buses and we are excited to be a part of this expansion. What’s even cooler is Hotboys is on these new buses. You can now see our FREE Heat Pump Tune Up ad on the side of WATA buses. This has been a great relationship between WATA and Hotboys. WATA’s bus routes serve the greater Williamsburg area, Yorktown and conveniently connect to Newport News. WATA also operates the Williamsburg Trolley and the Yorktown Trolley, providing multiple services to address local resident’s transportation needs. Hotboys services these same areas in addition to other parts of Hampton Roads in the repair of furnaces, air conditioners, heat pumps and much more. Did you know for a limited time Hotboys is offering a FREE Heat Pump Tune Up to qualifying customers living in the areas serviced by WATA? Our heat tune up is designed to reduce your utility bill by up to 30% and ensure the safety of your home. Heat pumps can be the hardest working mechanical component of your home and need maintenance from time to time. Seasonal maintenance of your HVAC systems is an important component of caring for your home. Our Heat Pump Tune Up offered in partnership with Dominion Virginia Power is an opportunity to have maintenance work on your heat pump done for free! And guess what else? Hotboys does more than just heat pump tune ups for Dominion Virginia Power, we also perform energy audits that help reduce electrical consumption. Less consumption translates to saving even more money on your electric bill. Look for our ad on a WATA bus near you! Mr Kevin came out and did a fantastic job. I do appreciate everything.